Governments & Trading community establishes the trade policy formation and aims to establish the National Trade facilitation body for all trading facilitation issues including Regulatory, cooperation, operational, customs, transit, logistics, Banking & Finance, Agreement and Collaboration. Trade facilitation is defined as simplification, harmonisation and standardisation of procedures & information required to move the Goods & services from the seller to buyer. The world trade organisation is global international organisation that dealing with rules of trade between the nations. The Goal of WTO is to ensure that the trade flows as smoothly between the nations. WTO Trade Facilitation Agreement comes into force on 22nd February 2017. The main objective of Trade facilitation agreement is to ease the customs rules & procedures for the flow of Goods Across the border. The implementation of this agreement has required to 2/3 of total members or 107 countries have to approve it. Under this agreement, 152 items under category B out of 265 items are included. In Modern world production process of goods or service is fragmented & different tasks are performed in different locations across the counties. However, its requires the timely production & delivery of inputs from one location to another. This kind of fragmented makes the Trade Facilitation Agreement (TFA) is more important. To prevent the illegal practices i.e under billing & misdeclaration. To have an option for the importer to return the rejected goods. It helps in ease of clearance of goods that is also in transit. Effective Co-operation between customs & appropriate authorities. TFA related to Import facilitation not Export. Developing countries will make huge investments to make the customs procedures better. Members of the state are required to publish the specified information on clearing the goods for import & export. it includes the rate of duty or taxes, rules or procedures. It creates the discipline on fees & charges imposed on or connection with import & export. For implementation of this agreement in developing or under developed countries, financial assistance will be provided by WTO & World Bank. On 20th July 2017, The Union Minister of Finance, Defence & Corporate Affairs , Shri Arun Jaitley said that the entry into force of WTO Trade facilitation agreement is major reform for Global Trading System. With release of National Trade facilitation Action Plan in national capital to ensuring the compliance with Trade Facilitation Agreement & Also to Trade facilitation. 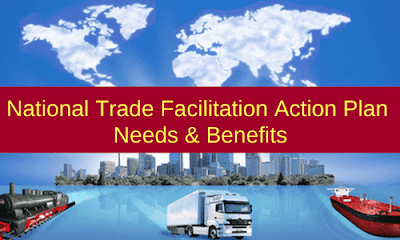 National Trader Facilitation Action Plan helps Manufactures & Entrepreneurs in ease of doing the Business or Trade beyond the limits of Trade Facilitation Agreement. The main objective of National Trader Facilitation Action Plan is to transform cross border clearance ecosystem through efficient, Transparent, risk based, Seamless and technology driven procedures which are supported by state of the art sea ports, airports and land borders. The World customs organisation (WCO)described as NTFAP is best practice or way that the national capital adopted. WCO secretary General Kunio Mikuriya said that it is a good document or a great function & we recommend it to all other countries. Dr. Kunio appreciated the various initiatives taken by Indian customs to facilitate trade with help of National Trader Facilitation Action Plan& massive reforms in Indian taxation system including the Term Goods & Services Tax (GST). Earlier, A national committee on trade facilitation headed by Cabinet Secretary was constituted. It has adopted 76 point National Trader Facilitation Action Plan which is reflection of the Government's commitment to implement the Trade Facilitation Agreement. National Trader Facilitation Action Plan covers many activities in many areas i.e road, rail, Ports (ICD), & airports infrastructures and land customs stations that cuts across all stakeholders for which various ministries like road transport, railway, civil aviation, home affairs, finance & commerce and tourism. All action plans covered under the plan have been categorized by activities into short term, medium term & long term.